Following an unconfirmed report from earlier this month that claimed Star Wars 1313 is currently on hold, Kotaku is now reporting that all LucasArts hiring and game announcements have been “frozen” since Disney acquired the company. According to the anonymous source who provided the information, this decision has impacted not only Star Wars 1313, but also the semi-announced XBLA title Star Wars: First Assault. LucasFilm trademarked and registered domains for Star Wars: First Assault last August, but never followed though with an official announcement for the game. In October the title popped up again with a listing on XBLA and some box art, however, LucasArts refused to confirm its existence. That was the last mention of the mysterious title, until today’s rumors. According to Kotaku’s source, Star Wars: First Assault is indeed a downloadable multiplayer shooter that was originally scheduled to launch sometime this Spring. The game supposedly supports two 8 player teams — one Stormtroopers, the other Rebels — and takes place on planets like Bespin and Tatooine. LucasArts was planning to release the shooter as a “step zero” to see if there was any consumer interest in moving forward with resurrecting the canned Star Wars: Battlefront III. 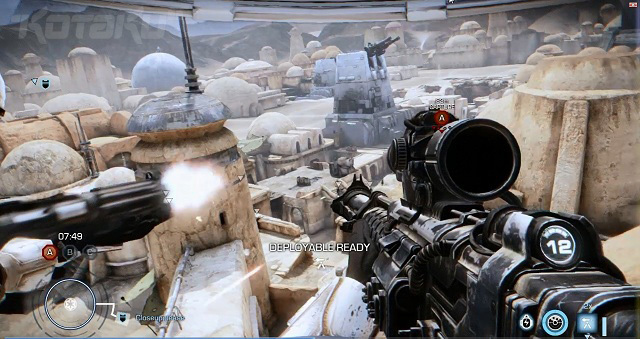 As such, First Assault was developed as a sort of lite version of Battlefront, with no vehicles or Jedi characters. Development on Star Wars: First Assault is “almost done”, according to the report, and it was due to have a closed beta last September and a full launch in Spring 2013 — this is backed up by the sudden appearance of the XBLA listing last October. Those plans were put on hold when Disney purchased LucasFilm last year and promptly “froze” all LucasArts hiring and game announcements, while they decided what to do with the studio. Despite the freeze, LucasArts has continued to work on the game since last September, however, it is unclear if it will ever be released. The anonymous source claimed that the studio is “bleeding talent” as staff can only sit and wait for a decision to come down from Disney and LucasFilm. None of this has been confirmed and should therefore be considered a rumor. With that said, the complete silence from LucasArts on games like Star Wars 1313 and Star Wars: First Assault is not exactly helping to dispel any of this speculation. Hopefully, we will get confirmation one way or the other in the very near future.